I'm 6'7" and looking for recommendations for a 70s/80s steel road frame that will fit large tires (38mm+) with fenders. A lot of tall frames seem to come with really short top tubes, but I'd prefer something over 62cms. Also, I don't really care about the components, I'd rather have a decent/nice frame I can upgrade along the way. I suppose I'm looking for the A. Homer Hilsen of vintage bikes. This may be a pipe dream, much like owning a Rivendell, so I'm prepared for a this to be a long-term search. I'm not very familiar with what was out there (alas, before my time), or how different bikes ride (not a lot of big frames to try out) so if there are any models that might be worth watching for please let me know. You have two choices: go custom or get a Dirty Sixer. As discussed on another thread, most topics seem to repeat themselves. Use google rather than the search engine on bikeforums, but include bikeforums as a search term. Not vintage, but look at Soma Double Cross and Black Mountain Monstercross. Both offer a XL frame with a 612 or 615mm virtual top tube and can fit a 40mm or 45mm tire. I rode a size 60 Soma Double Cross and put more than 15,000 miles on it before it was stolen :-(. It was a great all around performer. Last edited by Barrettscv; 10-16-15 at 05:08 AM. Under the old system, a 70 cm bike would work. Tallest frame today for a 6'7" rider is 64 cm. Works but then you need to raise the stem a lot to get the fit dialed in. Thanks for the responses but I suppose I should be more clear. I have a very small student budget and new frames/bikes are beyond my means. Alas, no dirty sixer or custom for me. Not to be snarky, but I do know how the google works.I was hoping a fellow brobdingnagian might have a recommendation for a vintage frame or two that can accommodate fatter tires. Yeah, pretty much a pipe dream, I'm sorry to say. If you want something that's even close to a reasonable fit, you're pretty much limited to '80s-era Japanese sport-tour bikes, which, like you already know, had short top tubes. And they didn't fit 38mm tires. Especially not with fenders. You might find a couple touring models, like the Centurion shown in the other thread, but it still won't have a long top tube and it still won't fit 38s w/fenders. Prolly won't fit 38s at all. Just searched my local CL with the word 'Tall'. Don't be discouraged, the bikes are out there; not saying my examples found in 2 minutes are the bikes worth buying - only that the larger frames are for sale. And dedicated flippers usually sell them cheap. edit: Lots of tall people in Minneapolis - I'd start there. Last edited by Wildwood; 10-16-15 at 07:13 AM. I don't know if there is anything out there vintage wise that will take fenders and side-pull brakes. You might be able to get a 38mm tire in if you do a 27" to 700c conversion, but I doubt you can get a fender on it too. Your best bet is the older touring bikes that came with cantilevers. 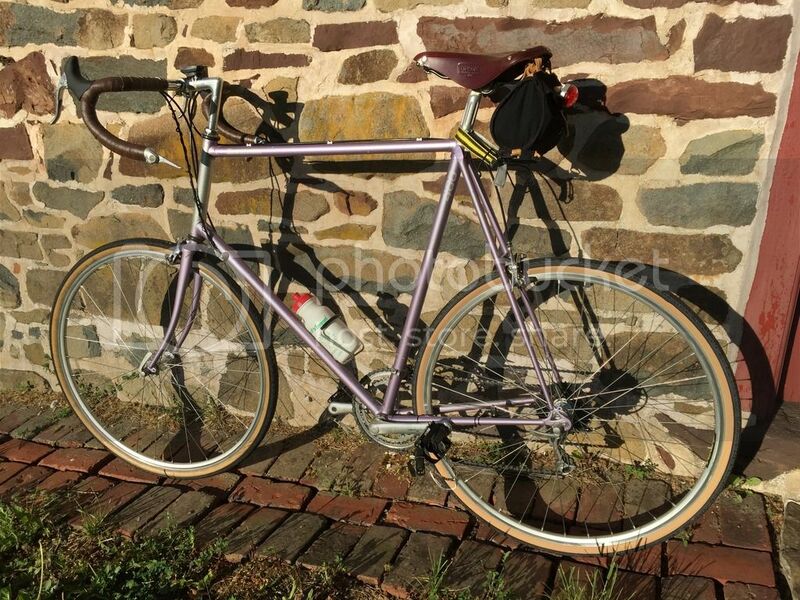 If you go to the tall bike thread oddjob2 linked you will see 2 of my touring bikes that will take a 38 and fenders. Both(Trek 620 & Centurion Elite GT) of them were 700c conversions. I see them more as more similar to a Riv Atlantis than a AHH. I am waiting to see what the Joe Appaloosa sizes will come in next year, it's supposed to be a cross between the Atlantis and a Hillborne. Last edited by Kobe; 10-16-15 at 08:15 AM. OP would need a 70 cm frame - that's the tallest he could safely straddle with an inch of seatpost showing. As long as a proportional frame could be found. Realistically, he's in the market for a 62-65 cm frame and there are plenty of those around. Thanks for the suggestions and reality check. I never thought about it much, but my Bridgestone 400 is pretty evenly spaced front and rear. If you prefer a longer top tube the Bridgestone's(61cm) have the longest of the Japanese\Schwinn\Raleigh's that I have tried. Your first mistake was in being 6'7" and looking for a steel frame. Walk away from the "steel is real" cult and ride a bunch of bikes. Steel almost never equates to a "good" big/tall bike. Too heavy and that gets exacerbated with all the frame material. Too flexy and that gets exacerbated with strong BIG powerful cyclists. The steel Zinn/KHS 747 can run upwards to 30lbs. One thing critically matters for BIG frames and tandems, frame stiffness. The bike you're looking for is a vintage Cannondale ST in the 27" (68.5cm) touring size. The original Cannondale Sport Touring series. Lighter, stronger, stiffer than anything you'll ever find in steel. Will sprint like Mario, climb like Pantani, and can be raced in a pinch when stripped of racks and fenders and with appropriate wheels/tires. Yet its a relaxed geometry recreational and touring bike that can handle such stupidly immense loads as would pop lugs on a steel bike and just wouldn't make sense to actually tour with. For tall cyclists 27" Cannondale ST bikes are the grail. If you're a very very good boy you'll find an ST 800 which came with a triple/long cage Superbe Pro drivetrain, believe it or not. 1" quill Nitto stem, bars, a Brooks saddle to make your willy go to sleep. Superbe Pro pedals with classic leather C'dale toe straps. Fenders and fitment for wide tires. Some models came with painted to match front and rear touring racks, cantilever brakes and three water bottle mounts. Others were more sporty with road caliper mounts. All are the same frames, just the details and the paint and components are different. STs were production bikes before Grant started working at Bridgestone and the very inspiration for his "country bike" BOBish/Rivedendell philosophy. You would be very very hard pressed to EVER find a better bike at ANY price point. These you can find on Craigslist. Usually selling the Superbe Pro pedals and the Brooks or Ideale saddle will pay for the bike, or buy you a new Phil Wood 630/27" freewheel touring wheel set with appropriate rims and higher drill spoke count. Ride a bunch of big tall bikes. Question the kool-aid of the "steel is real" cult. You'll never EVER get a rocket put a smile on your face steel bike in your size. Doesn't' exist. Just a boat anchor inefficient compromise. Big/Tall frames are unstable to begin with little 622/700c clown size wheels. They inherently suffer from "death wobble" that is only made more problematic by frame flex. Get a Cannondale ST and keep the 630/27" tire size. Gives you 4mm larger wheel size dropout to the ground, and 8mm on the diameter. Get custom cranks in the 195-205mm range. Then ride the snot out of it, and be thankful you were saved from the "steel is real" cult to actually find the bicycle you were born to ride. Then drop all your friends on the flats and rollers as you lay down the "Big Mig" pain on group rides. Then watch them become confused when your Sport Touring Cannondale actually climbs with aplomb. They won't understand why their steel rides that are so celebrated on Intagram aren't proving to be "better" bikes than your aluminum C'dale. Everyone knows steel bikes are better, right? Last edited by mtnbke; 10-16-15 at 01:30 PM.